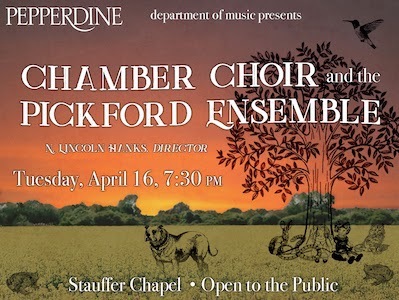 The Pepperdine University Fine Arts Division will present the Pepperdine Chamber Choir and The Pickford Ensemble at Stauffer Chapel in Malibu on Tuesday, April 16, at 7:30 PM. The concert, which will be conducted by music professor N. Lincoln Hanks, will feature world premieres of works by Pepperdine alumni composers Matthew Brown, Jens Ibsen, and Thomas Yee. Composer Clayton Briggs and librettist Molly Reisman have also composed a new short musical theater piece called Electric Circus, featuring performances by our Pepperdine students across both the Seaver College Music and Theatre programs. This event is open to the general public and admission is free. For additional information, visit the Center for the Arts website. For those unable to attend, the concert will be available via Livestream.